This post is about my favorite Benjamin Moore warm gray paint colors or sometimes we call the color, greige. Greige if you don’t know is a term for a color that looks like yesterday’s oatmeal. It’s become wildly popular. In plain English, it’s gray and beige combined. When darker, the term is bray or you got it, brown and gray. Before I get into the colors, I feel the need to get something off my chest. It’s about photos and computers. As you know, photography has come a very long way in recent years as has computer technology. However, what I have discovered is that the camera does not necessarily see color the way our eyes do. Furthermore, our computers interpret the colors with their filter. Therefore, what you see on your screen ain’t necessarily what you get. It’s always been that way. Before the digital age, I found that photos were often yellow and/or red tinged. Now, I find they tend to go blue and/or purple. They went way blue/purple when I was using a PC. On the macbook, far less so. That’s what I’m using now, which tends to go more yellow. As a designer, it drives me a bit nuts because I want to represent the colors as closely as possible. Alas, it’s impossible. When I look at photos I edited on my PC on my Mac, I’m horrified. I’ve decided that in the scheme of things, that this is not actually very high on the horror scale and to just live with it. Oh, wait. One last thing, I promise. The colors below are NOT necessarily what the room was painted. That is impossible to know. In fact, it’s a bit of a joke. However, it’ll give you an idea at least, I hope so. Classic Gray is a pale, pale gray with warm undertones. Very pretty. I’ve never used it, but it’s one of Loi Thai’s go to colors and that is recommendation enough for me. Pale oak is a true greige. Again, I’ve never used it, but it’s one of Candace Olsen’s colors. ’nuff said. Pale Oak again in a bathroom with a deep red mahogany floor. The marble looks to be calacatta gold, or something of that ilk. By the way, for those of you who know how I feel about a lot, not all, but a lot of shows on HGTV, their website is like a completely different company! It’s terrific! and this one are all representative of hands down the MOST popular warm gray of them all! And guess, what? I JUST specified this one [or rather the clients selected it] and saw it in person for the first time yesterday. It’s going in two identical very small bedrooms with a pitched ceiling and dormer window on one side. We took the color all the way around and it is perfect! It’s a gray with a lot of beige in it, but it can also look a bit silvery or warm or every so slightly taupe or khaki depending on the light. But I find that with almost all of the warm grays that they can vacillate between slightly red/violet and green/yellow undertones. Gray Owl, really could’ve just as easily gone in the last post about cool gray paint colors. Its one that I think straddles both worlds pretty evenly. However, it does have some greenish, yellowish undertones which makes for a lovely non-cold gray which is also very popular. Alright. I have to admit that I was a bit on the fence about this color. Sorry, but on the chip, I think it looks like cat puke. However…………………. I researched this one ’til the cats came home and could not find one person who had anything but the most glowing love for this color. Anyone? Any experience? But good case in point. The chip is only a SUGGESTION. AND… never, but never look at a color horizontally. It’s going up vertically [unless of course, duh the ceiling] and you have to stick the chip flat against the wall! For more tips on how to get the color right, the first time, please look here. I have used this one! My client last year was so cute. She went out and must’ve gotten about 30 test quarts. And then she made big poster board samples of every color. She really did it the right way and loved this color the most. This went up in a very large great room with cathedral ceilings and a big stone fireplace! Very interesting. The color is so, so pretty! It’s not anything that you would ever go… “Oh, what IS this color?” It’s just a whisper of a soft warm gray. On some walls, a very slight, slight, slight lavender undertone, but then on others, very slight, slight, slight green undertones. It’s just warm, light and lovely. You can’t go wrong with Balboa Mist. Another fabulous image by Phyllis Higgerson of the Henhurst Blog. If you don’t know her blog, I heartily recommend it. She has fabulous taste and her home is exquisite. You might recall her astonishingly gorgeous images from her day with Bunny Williams! Shale is a color I haven’t used. It appears complex and rich and is the darkest color here. Although, it is not at all dark. It is on the light side of mid-range. I think it’s a warm gray that would appeal to both men and women. Fabulous transitional living or family room. Beautifully styled bookcases too. Warm grays look wonderful with dark rich blues. And finally, Abalone. I used Abalone last year in two bedrooms in a lake house. Well, one is more of an office. One room is more sunny but the other one faces due north and is dark. The color looks gorgeous in both rooms. There is a very subtle undertone of violet, but there’s enough brown and gray to keep it from ever looking purple. It’s a very lovely color. I highly recommend it. note: 10.15.2017 – apologies. 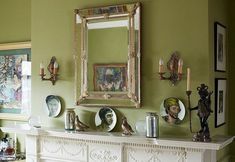 I had this image incorrectly credited to John Jacob, another fine interior designer, but this is from Ben Pentreath’s and Bridie Hall’s fabulous shop in London Pentreath and Hall. For more helpful wall paint info, please click on the following links. The perfect white trim color for your warm gray paint. 20 great shades of white paint. Love Farrow and Ball but not the hefty price tag? And are you possibly looking for Benjamin Moore cool gray paint colors? If so, click here. By the way? Do you need any Benjamin Moore Fan Decks? You can get them below. So glad that the posts have been helpful for you! I fully get how difficult it is to make a choice. It’s not like you can just flip a switch and make it something else. Although, lighting is super important! Most of our home is done in Edgecomb Grey, and it seems to always “take on” the tone of whatever else is in the room. I have never seen a purple undertone, though. I have used Benjamin Moore “Vapor” (AF-35) for my trim color throughout and love it! Edgecomb is one of those colors that can change and I can guarantee you if it looks ever so slightly violet one hour, come back in two or three and it might look ever so slightly khaki. I have seen that. That is why it’s important to make separate samples moving them around the walls and looking at different times of the day. I know exactly what you are referring to because I once had a job with north facing windows on one end and south facing windows on the opposite end (of course) of a rather long living room. The color changed considerably from one end to the other. But something I’d like to point out to you is that if your room is freshly painted, I am guess that there’s nothing on the walls yet and perhaps the room isn’t even decorated with window treatments and other furnishings. And the other thing is… and I do this too… but you are undoubtedly focusing on it because it’s new. I’ve been trying to find a gray to emphasize my golds, greens and reds in my living room and dining room which open up to each other.. My rooms are small and dark (Chicago winters!) with east exposure. I’m thinking of painting the walls light gray and the ceilings a light gold to reflect light, like BM Antiquity OC107. Warm gray is recommended for my colors, but some blogs have said that using gold with a warm gray will muddy the gray. Your site is very helpful, although I just found it yesterday. Lots of information. My experience has taught me that most, not all, but most guys who paint are not the ones to ask for advice about color. The two talents don’t necessarily co-exist. Funny, but I was just telling someone about my dress from J. Mclaughlin. What a coincidence! The colors sound really lovely! It sounds like you would like a bit of a metallic finish? Benjamin Moore makes a metallic glaze. Here’s what I would do. Google the information to see if there are any tutorials. Then, consult with your BM paint dealer that you like in your area, if that’s the brand you wish to use. Or, just try out a few different colors and make samples on a spare piece of architectural tile. If you can, hold it up or even tape it to the ceiling and move it to a few different spots. Keep in mind, that the color will tend to lighten once on the ceiling, especially if there are a lot of windows. It will look deeper in the corners away from the windows. I’m in desperate in need of help. We recently purchased the gray gia sofa & chair from Crate & Barrel. I have yet to settle on a color for my opened space coop. I’m looking for a warm but yet contemporary look. Usually I paint the trim one color through-out the home, but of course, not always and there can be some rooms where it gets switched out. I love and have written about painting walls and trim the same color (but different finishes). This is wonderful particularly for libraries and offices but can also be used in other rooms. 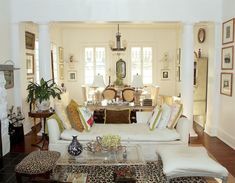 It depends partly on the style of the home. After driving myself insane for weeks trying to pick one color for the den,hallway, foyer, staircase walls and upstairs wall of my somewhat open concept floorpan, your site made it easy for me to choose Gray Owl. It is up and gorgeous! Problem is this: we moved into our home two months ago and we like the kitchen, wouldn’t have been my first choice but it works. 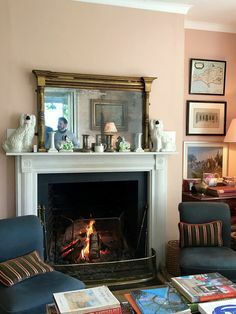 The paint color is Sherwin Williams basket beige and it looks lighter than chip and it is a north facing room so looks a bit lighter and greener. Anyway, the trim in the kitchen is definitely a creamy white(I see yellow) and now that the gray owl is up in den, the kitchen and den flow together somewhat(can see each room from another even though there is a definitive doorway) my husband painted an off the shelf bright, crisp white in there, no undertones at all it is just WHITE. It looks great with gray owl but huge contrast between kitchen and den!! He hates me now because I said we have to do something to fix this. Either repaint trim in den OR change entire kitchen!! We didn’t want to change kitchen….don’t have the time or money tree right now lol. SO….is there a trim paint that we could change den to that will flow better? We do not know the trim color of kitchen because previous owners left us nothing. The kitchen has cream painted cabinets with a glaze resulting in warm creamy cabinets, the basket beige walls(SW paint) and warm honey oak hardwood floors throughout house, granite is defintely warmer with browns,blacks but some white too. I am trying to make this flow without redoing kitchen colors too. I write this same note about 20 times a week. I’m not exaggerating. But I can’t give individual advice in the comments for all of the reasons you can think of. I’m sorry. 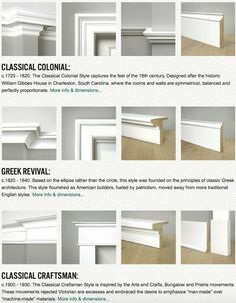 My paint guide will have lots of suggestions for a great shade of white that will work well for you. I list the shades of white that go with each color and Gray Owl is one of the Laurel Home Essential Paint Colors. Would a warm grey go with golden knotty pine floors in a simple colonial house. Looking at Balboa mist, classic grey, revere pewter, collingwood and abalone based on your suggestions. Other choice is to stay with the creams. Thinking of rich cream by BM. This is going to bring out the most sarcastic side of me. It’s not you. It’s them. What’s the difference between those two Gray Owls? It’s the same damned color. THE. SAME. COLOR! That’s a very good question Mer. Many, many of the OC #s have duplicate numbers–mostly in the same fan deck! Some of them are also ready-mix, like white dove, linen white, etc. (in both of the large fan decks) and a few, I believe are from the classic color collection which has anywhere from three to four digits. So, if the name is the same, it’s the same color. If you look in the back of the color preview fan deck, you’ll see that. A well-known one is Ivory White and Acadia White AC-41. AC stands for Awfully Confusing. Laurel, thanks for the beautiful articles on the different Grays. I have a question. I am getting ready to paint some of the rooms in our new house Gray. The first room is the living room combo dining room which is cobalt blues and white w/some champagne intermingled. This room faces the North East. From this room, you can see the family room / kitchen (great room?). It has a wheat sectional with area run in wheat dark Gray & beige design. The Kitchen cabinets are going to be painted a dark tone of whatever Gray I go with on the walls. This room faces South West. All of the rooms get lots of light depending upon the time of the day. My question is when it comes to cool and warm Grays. My colors of cobalt in the one room I feel should be done in a cool Gray and the wheat colors in the family / Kitchen should be in a warm Gray. All of the trim – base boards & doors will be in white. I would prefer to use one color Gray in all of the rooms if possible and using a light Gray to keep the rooms light and bright. Is there a Gray that will work with both of my color schemes without giving off an undertone that will possibly clash? Thank you for any help you can provide on this. I’m so sorry but the comments are to discuss the post or general advice that will benefit other readers. Otherwise, it’s a paint consultation which I’m not doing right now and if I was, there’s a hefty design fee. I can’t see what you are talking about! I can’t see the precise colors, the light, the other things going in the rooms, the style of your home, the size of the rooms and windows, the height of the ceiling, the floors. It goes on and on… And what if there’s a chink in the system and there’s something that isn’t working at all? What I recommend is going to the store and picking up some sample strips if you don’t have a fan deck. Pick a few colors you think you might like and pin them up, one at a time. Then, narrow that down to 3 or 4 and then go to the store to purchase your test samples. Make the boards and move them around. Thank you Laurel!! I will do as you say and let you know how it works out. Hope you had a wonderful day!! You’re confused, because it IS confusing! Because when we are talking about color, we are talking about the light that it is reflecting. The prevailing thinking is pretty much what you say, except that I’m not a big one for hard and fast “paint rules” because light changes. For instance, my bedroom faces south and west, but in the morning, it’s more like a north facing room and on a gray day it’s well… gray! Then, at night—it’s always the same, of course. Nobody ever seems to talk about that. This is why Iargely prefer to classify rooms more as light and dark and because you can have a dark south facing room and a bright north facing room! Some colors seem to look good no matter what. But they will look different is all. Arrrggghhh, painters! Not all, but too many do this. Us designers aren’t telling them how to paint! It’s unbelievably tacky if not downright unprofessional when they feel obliged to contradict a designer’s judgment. It shows a total lack of respect for our abilities. On top of it, they have NO idea what else is going on in the room. It happened to me recently and fortunately, the client ignored him. She’s thrilled with the color, BTW. Thank you Linda! Here ya go! I can’t really make any recommendations in the comments for or against paint colors because I’m not there and especially because you are already working with someone. I can’t see what else is going on or how the light is working with this color. But… working with a room with cathedral ceilings is very different from a room with an 8-ft ceiling. You cannot look at one sample. You need to make a sample board and tape it flat against the wall, moving it around the room, both high and low to get an accurate read of the color and how it will look on different walls and lights. Ahhh… you’ve touched on something that I’m sure I’ve mentioned somewhere in these 300+ posts. And that’s that it doesn’t matter where you live. The light is ALWAYS changing, unless you live in a room with no windows. However, some places like Florida that are further south and the land is flatter may have larger extremes. Although, my living room if I didn’t have shades on the windows, in winter come noon-time is blindingly bright! I always try to see the wall color as part of a composition. It’s like a painting. I may not love all of the colors individually, but together, they make for something pleasing to my eye. I have painted our living, dining and foyer rooms in Edgecomb grey. I am currently working on an old cabinet in my foyer. I painted it Scandinavian Pink by Annie Sloan. I can’t say I love it and was wondering if you have any suggestions that would work better. I do welcome your expertise! Hello! Great articles & information! Right now I am studying your tips on wood flooring, and the “cool” gray & “warm” gray paint colors. We are rehabing a 6K sq foot house top to bottom. I have used your advice & techniques to pick my trim color. I went with BM AF-35 Vapor, and it is marvelous! I have also used BM HC-173 extensively and love it! Currently, I am trying to select a color for our kitchen/great room. It faces south, & half of that is a wall of windows (15′ long x 6’high). I painted the room HC-171 Wickham Gray, and it turned the most pastel “baby blue”! What effect does the southern light have on the color in that room, and does it affect cool colors differently than warm colors? The light affects all of the colors but it’s a combo of the light and the undertones in each shade. Then, there’s the time of day. So, Wickham might look baby blue in the morning and then go grayer in the afternoon or vice versa. I can’t predict how a color will look because it’s not just the direction of the light but how many windows, how big are they? Is there a big hill, water, an awning, a red convertible parked outside? Hi there, beautiful colours, thank you. I also love Balboa Grey, and am wondering if it will go with my sage green couch,and warm maple floors. My living room has corner windows one faces east, the other is south. I prefer a warm, cozy look in my space, and wonder which colours would compliment the Balboa Grey walls/Sage green couch. Hope you can help, thank you, much appreciated. Speediest response ever! haha! You mean Balboa Mist, right? We used this color for a very large living room last year and it is probably the perfect neutral color. It does change ever so slightly. Sometimes I saw hints and I mean hints of lavender and sometimes tiny hints of green. Again, very tiny. Over-all, it’s a lovely soft, shade of warm gray. In answer to your question, based on my experience, I would say that it goes with everything! However, as always please make a nice big sample and move it around the room. Live with it and look at it in different lights and with your sofa fabric. Just wondering why you think Edgecomb Gray is similar to cat puke…sort of leaning toward that colour but can’t get that out of my head. Also you didn’t give a personal opinion of collingwood other than the fabulous image, does it lean towards the mauve? Love your comments, very helpful! Very honored to be featured here today, Laurel! Many thanks!! I have loved these posts and the extraordinary choice of photographs that illustrate how luscious the colors are in their ‘natural’ environment. Stunning and thank you. I have a favorite BM ‘greige’ that did not make your list but I did want to mention it. Bleeker Beige is more of a greige than beige; or so it turns out in my home. It has a strong green undertone. Depending on the time of day, it can morph into any one of the three colors. I wonder if you have ever used it or have an opinion about it. I have used Bleeker Beige and it’s lovely. It didn’t make into this post but it will in either another post. I had to make a decision regarding categories. Today’s were the lighter warm grays and Bleeker was a bit too deep. I’m going to do a post about darker grays, but am first going to hit green, because it’s March! Of course green is HUGE! But, I will also hit the other neutrals, such as beiges, khakis, taupes and browns, etc. That’s probably as clear as mud. lol however, there are some colors which straddle different categories– the ones that aren’t easy to describe. But, I’ll definitely be getting to Bleeker Beige!